The Kingdom Community Wind project is being built in the Orleans County of Vermont, US. The turbines reduced the power generation cost for the project. Vestas supplied its V112 3MW turbines for the project. The Kingdom Community Wind (KCW) project is a 63MW wind farm built in Lowell, Orleans County, Vermont, in the US. The project was jointly developed by Green Mountain Power Corporation (GMP) and Vermont Electric Co-op (VEC) under a partnership formed in October 2009. The estimated investment in the project was $150m. GMP owns the wind farm and VEC receives the power generated. The arrangement is part of VEC’s strategy to partner with companies interested in building facilities that will supply power to its customers. Reed & Reed was the contractor for the project. "The project was jointly developed by the Green Mountain Power Corporation (GMP) and Vermont Electric Co-op (VEC)." 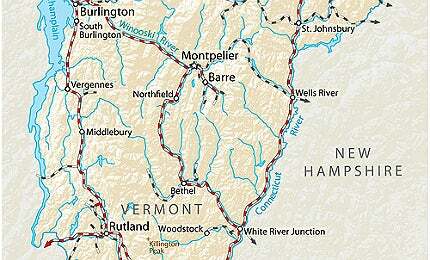 Vermont state regulators approved the project in June 2011. Construction commenced in September 2011. The first turbine of the project was erected in July 2012. The project was completed in November 2012. The wind farm reduces pollution in the region by displacing 74,000t of carbon dioxide emissions annually. The project also lowered electricity prices for customers. It generates nearly $40m in federal production tax credits, which help in reducing the amount customers pay for the power they use. The power generated meets the requirements of 24,000 households. The project provided an economic boost to the region with the creation of new jobs. It also generates facilities tax and property tax payments. The payments are diverted to the state education fund and also to the Good Neighbour Fund, which support five neighbouring communities. The Lowell Mountain Range was chosen as the site for the construction of the wind farm. A three-mile portion of the mountain range was used for constructing the wind farm. The site is a working timber farm with elevations in the area ranging from 2,200ft to 2,600ft. The area features strong and persistent winds in the west north-west direction, making it an ideal location for building the wind farm. An environmental assessment study was conducted at the site in 2008 by Vermont Environmental Research Associates. The study did not identify any serious impact on the region due to the wind farm. The wind farm has 21 wind turbines erected across 2,000 acres. The site is accessible through an exclusive road along Route 100 of Lowell. In June 2011, GMP selected Vestas to provide wind turbines for the project. Vestas provided its V112 3MW turbines. The turbines are 400ft tall and have a rotor diameter of 367ft. The blades are 179ft long. The turbines feature various noise modes that can be used to meet specific noise level restrictions. Three transmission lines are used to transfer electricity generated by the wind farm to the grid network. Two 34.5kV transmission lines run along Route 58 and Route 100 of Lowell. Another 46kV transmission line passes from Lowell to Irasburg. These lines transmit power from the wind farm to two existing substations owned by VEC and Central Vermont Public Service Corporation. The close proximity of the transmission network further reduced the project cost. The project reduces the need to import power to fulfil the electricity demands of the region. "In June 2011, GMP selected Vestas to provide wind turbines for the project." Power imports form 70% of VEC’s operating expenses. With the construction of the new wind farm, VEC expected to secure low-cost and reliable power for the region. The project also satisfies six to eight percent of the generation needs of GMP and four percent of the generation needs of VEC. The Silver Star 1 wind farm added another 60MW to Texas’ increasing renewable power supply. Prairie Fork Wind Farm (PFWF) is a large onshore wind power project that will be built on 25,000 acres in Christian and Montgomery counties in central Illinois, US. Juniper Canyon is a 250MW wind farm under construction in Klickitat County, to the south-east of the city of Glendale, Washington.